ヤップにいた時の姿になって報告する参加者。Students wore clothes which they used in Yap. 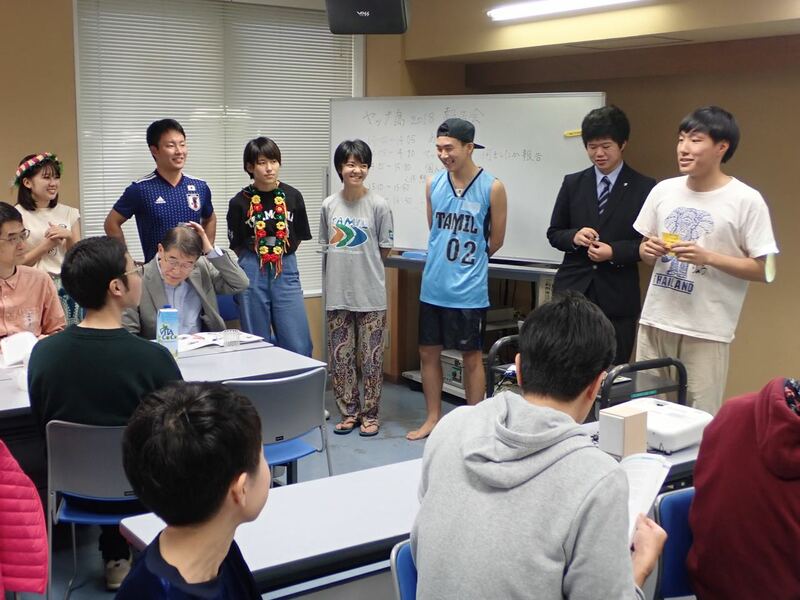 On December 1, at a community center in Chiyoda, Tokyo, the reporting session of Yap-Japan cultural exchange program was held. 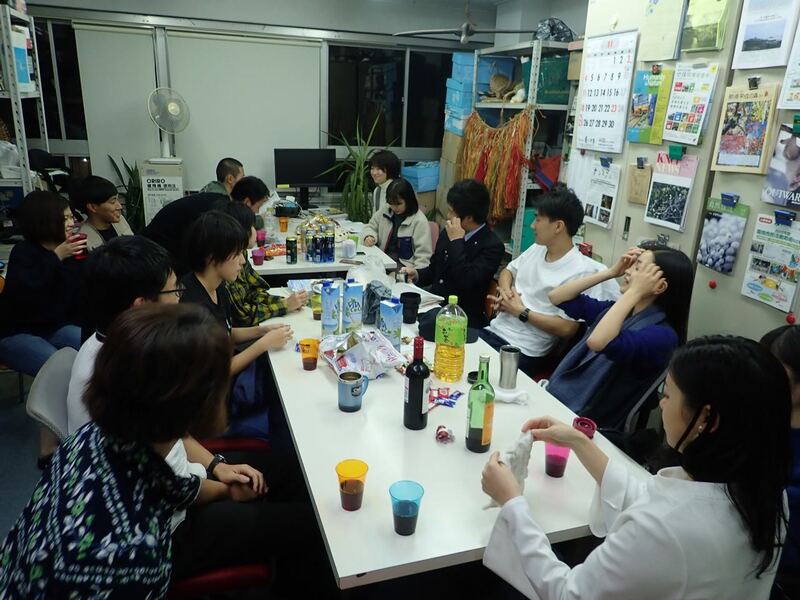 Among nine participants of the program, excluding two who are in an expedition in Costa-Rica and in busy study before exams, seven university and high school students were gathered in front of family members and friend, in total of close to 30. During the session, the word, “Love”, was repeatedly mentioned. “I was strongly held by armes when I was slipped over the floor”, “The family made me local medicine when I got sick at home-stay period”, and other stories were told. In Japan, those students are surrounded by smart phones and convenience stores. For such spoiled life, direct communications seeing each other in Yap was so impressive. 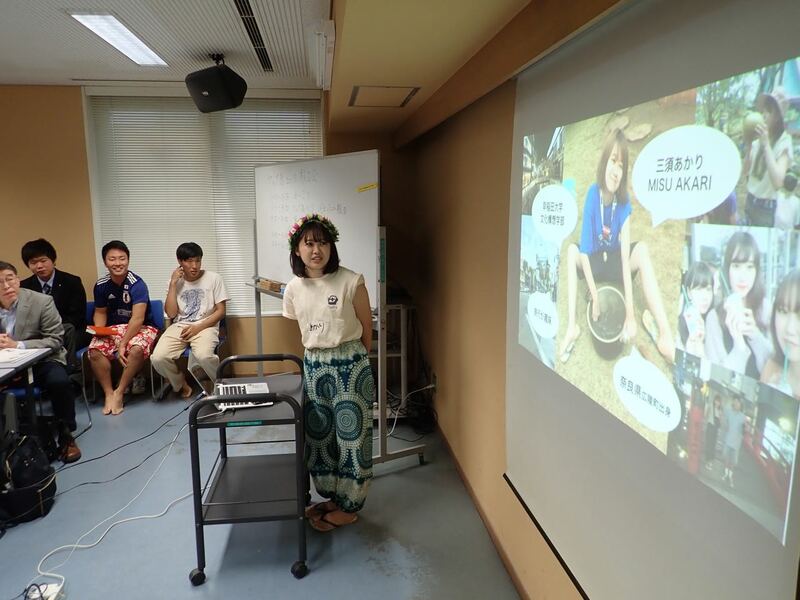 スライドを使って現地の様子を報告、Showing slides, each participants told their deep experiences in Yap. Family members told that “I believe surely that they had very significant experiences in Yap”, or “He had so exciting days, I am feeling” after hearing their presentations. Some participants came from far away, like Kochi or Osaka. They kept talking just before the final train and the day after, many of those spent fun time at Tokyo Disney Land together. They did not want to be separated again. They look like understanding that the real program would begin after the whole activities in Yap. We really appreciate strong support of people in Dechmur village and Yap island.